Rio Bend RV & Golf Resort is offering a deluxe park model made by Schult Homes featuring spacious closet and counter space in the kitchen. This is a great park model for resort style living and entertaining. We have many floor plans and price ranges that meet everyone’s needs. Our package includes, complete setup, HVAC, all utility connections, skirting and steps. Included in our price is one year FREE site rent. 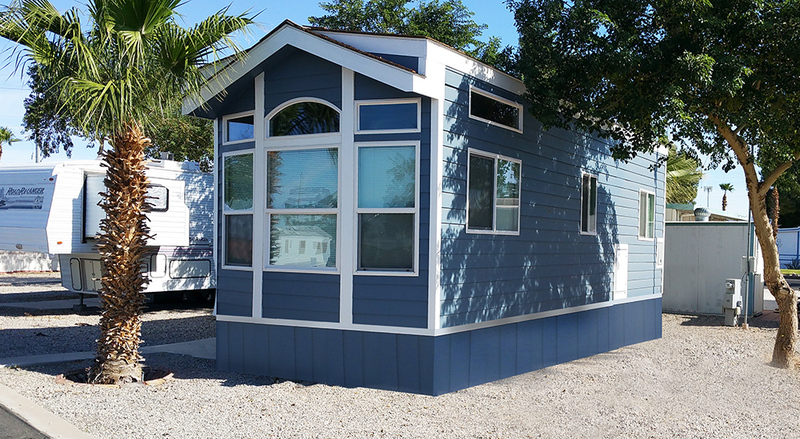 We have Dutch Park models available at the basic price of $26,995. Excellent investments – suggested monthly rent is $1,900 – $2,100 a month. The perfect retirement home with golf and over 100 planned activities and amenities offered by only a double 5-Star Resort. Awarded “Best Parks in America” and Woodall’s Double 5W in activities and amenities. Call, write or email us for more information on how we can be of service to you in selecting a park model home. *During season park models must be rented for a minimum of three months. *Monthly fee of $40.00 for service and maintenance is charged to each site. *Electric and propane not included in monthly rate. A $500 security deposit will hold your park model reservation. Your total rent is due and payable at time of arrival. The deposit of $500 is refundable after facility inspection approval. The refund check will be mailed from the corporate office within 30 days. Cancellation requires a 60 day written notice. An administration fee of $200 will be withheld in the event of a cancellation. No refund if less than 60 day notice is given.